I have this error when log in into a remote server throught ssh. The error also when I run a bash script. 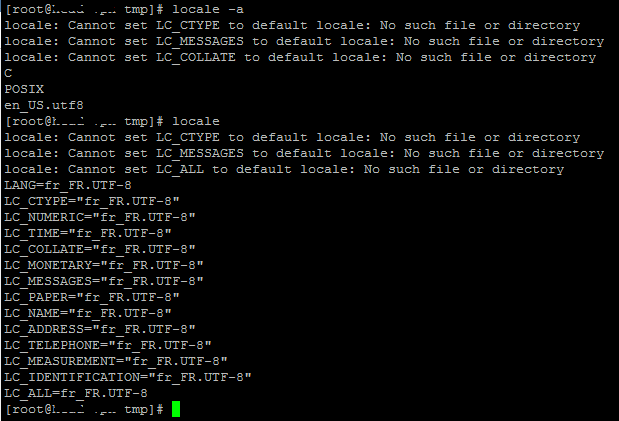 I tried to reinstall glib with yum reinstall glibc-common but the error is still here. Comment out or delete the line "override_install_langs=en_US.utf8" in /etc/yum.conf. Not the answer you're looking for? Browse other questions tagged linux centos centos7 localization or ask your own question. How to install keyutils on CentOS?